Click 'Hunt Now' to Log In to your GSC account or Sign Up as a Golden Screen Cinemas member. Register your Receipt Number to receive your instructions. Only receipt numbers from the movie tickets purchased via GSC Box Office, GSC Mobile App and GSC Website can be used for the contest. The validation date for the movie tickets purchased is from 01 July 2017 – 08 September 2017. Beat all 3 levels and stand a chance to be one of the lucky contestants to win up to RM30,000 worth of prizes! Please keep your receipt as proof of purchase! Patiently wait! This contest will run from 07 August to 03 September 2017. Winners will be notified via e-mail. 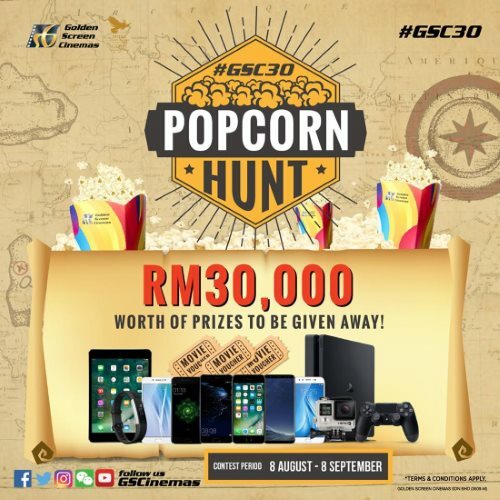 Visit #GSC30 POPCORN HUNT Contest page for more details.